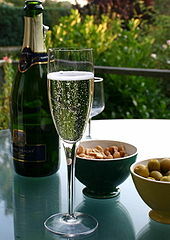 A Champagne glass is a form of stemware designed specifically to enhance the drinking of champagne. The two most common forms are the flute and coupe. In each the stem allows the drinker to hold the glass without affecting the temperature of the drink, making them readily adaptable to consuming other sparkling wines and certain beers. The champagne flute was developed along with other wine stemware in the early 1700s as the preferred shape for sparkling wine as materials for drinking vessels shifted from metal and ceramic to glassware. Initially, the flute was tall, conical, and slender; by the 20th century, preferences changed from a straight-sided glass to one which curved inward slightly near the lip. The champagne coupe is a shallow, broad-bowled, saucer shaped stemmed glass generally capable of containing 4 to 8 US fl oz (120 to 240 ml) of liquid. Legend has it the shape of the coupe was modelled on the breast of the French Queen Marie Antoinette, wife of King Louis XV of France, but the glass was designed in England over a century earlier especially for sparkling wine and champagne in 1663. The coupe was fashionable in France from its introduction in the 1700s until the 1970s, and in the United States from the 1930s to the 1980s. Champagne is also served in a tulip glass. The white wine tulip is distinguishable from the champagne flute by its wider flared body and mouth. Some oenophiles prefer the tulip glass, as it permits the drinker to get more of the aroma than a traditional flute while the mouth is still narrow enough to avoid quick loss of carbonation. The Washington Post food columnist Dave McIntyre has argued that the tulip allows the champagne to move to the middle from the front of the tongue, allowing the wine's flavor to be better expressed. The glass maker Riedel particularly criticizes flutes as one-dimensional, impairing drinkers' ability to appreciate a wine's full range of aromas and taste profiles. ^ McIntyre, Dave (October 1, 2017). "Don;t believe the hype. You don;t need glasses in multiple shapes and sizes to enjoy wine". The Washington Post. Retrieved December 9, 2017. Sezgin, Pam (2010). "Drinking Glasses and Vessels". In Black, Rachel (ed.). Alcohol in Popular Culture: An Encyclopedia. Santa Barbara, Calif.: Greenwood Press. ISBN 9780313380488. Villa, Keith (2012). "Framboise". In Oliver, Garrett (ed.). The Oxford Companion to Beer. New York: Oxford University Press. ISBN 9780195367133.